You are currently browsing the tag archive for the ‘Liberal Viewer’ tag. Fiscal conservatives give me a headache at the best of times. Having them opine about how availability of birth control is going to drive up costs and make every one sad, well…makes me sad. It would be nice, for once, if our conservative friends would base their opinion on something more than a dogmatic adherence to free-market wisdom. The air out here in empirical evidence land isn’t so bad, honest. 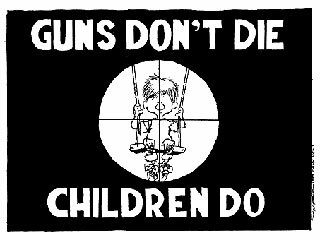 The DWR Sunday Disservice: Liberal Viewer – Guns & God – Oh, and Dead Children too. The idea that with a little more god in school tragedy is avoidable really burns my buns. Adding more falsehood to peoples lives is never a good thing. It saddens me to see people talking so unabashedly about how their magic dude in the sky could fix things if only people believed in him. These are not your run of the mill godbots, but elected officials. These are the people who we are supposed to trust with our welfare; espousing beliefs equivalent to saying unicorns and dragons exist. Mind boggling. The NRA is a nasty piece of work, with fetishistic cult-like tendencies that, when not actively promoting a misinterpretation of the American Second Amendment, are engaging in the audaciously vulgar misinterpretation of what self-defence is. No regular citizen needs a gun capable of firing five bullets a second. Lastly consider the following, owning a gun means that you have an instrument granting you the power of near instantaneously killing another human being and that is the real purpose of guns – killing people. Liberal viewer intersperses reactions from the republicans and the democrats on the recent school shootings and it would appear that other than the ‘more god’/’arm everyone’ mumbo-jumbo the Right has nothing to offer. I think Fox News sometimes tries really hard to be of use to the American public, but that urge, once realized, is quickly woven into partisan propaganda. Liberal Viewer brings to light what the ALCU is doing against the unlawful surveillance of its citizenry. As a Canadian, I realize we are just a couple of months behind the legislative cycle, thus this sort of Big Brother stuff is slated for Canada as well. Deceptive, misleading and manipulative. That would be the Faux News in a nutshell. Liberal viewer carefully dissects the bullcookery for your viewing pleasure. Oh Mittens! – There you go again. Liberal Viewer (and everyone else) has decided that Romney should show a little more love to the moochers and freeloaders of American society. Americans force fed their concerns from the elites handbook need to see Liberal Viewers 101 guide to the economy or even just to get a sense of what is going wrong and how crazy it is to support people who are for “more of the same”. I wonder what colour the sky is in the land of Fox News. I really do. The level in inaccuracy and partisan slant censorship present is an obscene injustice against the American people and their right to know what is done in their name. Certainly we can make fun of our ignorant neighbours down south, but we’re missing the point, we should be ridiculing their fatuous news media for the gross veil of ignorance that twists how Americans see themselves and the world.